Today I re-read Psalm 118, and was pleased to read this famous verse: “This is the day that the Lord has made; let us rejoice and be glad in it” (118:24) But the next verse surprised me: “Save us, we beseech you, O Lord! 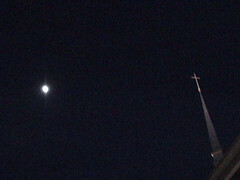 O Lord, we beseech you, give us success!”.. Give us success? I’ve always heard, probably because it’s what I wanted to hear, “Save us!”. But the success part? 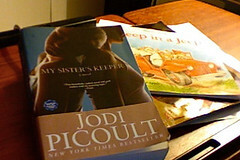 I’m currently reading “My Sister’s Keeper” by Jodi Picoult. There’s a movie, too-I think it came out in 2009. Go here for a synopsis, but suffice it to say that I’m intrigued, half-way through the book as I am, by the different ways that each main character might define “success”. I shouldn’t be, because that’s life, too. That’s humanity. And yet, in the book, at least, people love and care about each other (again, I’m only half-way through). How do we define success, in our lives? Do we pray for it? If so, what do we expect or hope for? And how would our answered prayers then affect others—both those we know, and those we don’t know? “our mouth was filled with laughter”. Kajsa is often filled with laughter. And her laughter often fills me with laughter.. even if I don’t feel like laughing. Often, I say. Because there are times when she’s simply stalling from doing what we’ve asked her to do. 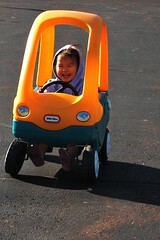 But mostly, Kajsa’s laughter is contagious. And it reminds me of what restoration feels like–restoration thanks to God’s work, God reversing fortunes.. God doing great things for us. Where does that leave those who don’t know this feeling? or feel this, when things are going better? Sometimes laughter is possible, but mostly it’s discouraging, when others get to laugh from the pure joy they experience.. and when some aren’t able to share that. What’s the answer? I don’t know. I’ve been in both positions. And of course I prefer the laughing, because of God doing what I consider to be great things in my life, or the lives of others. Of course. But I also am discouraged at the amount of continued chronic pain that others (and myself, at times) experience…. how long, O God? How long until they, too get to be filled with laughter…? Spring seems to have arrived-almost. Enough that even I, full-fledged-snow-lover, am ready for Spring. I got a taste of the warm weather and sunshine last week, and it was beautiful. The spring-like fever grew for me as I noticed the lambs (I think) at the farm behind our yard/the church parking lot. I actually saw them from my office window yesterday, but paid more attention today. And took some photos. These three lambs jumped, ran, ran into each other, leapt over things I couldn’t really see.. they were so full of fun and joy, that I felt joyful myself. I felt like praising God, just by observing the frolicking lambs. Even the miniature horses seemed to be playful and joyful today. Psalm 32:11 says, “Be glad in the Lord and rejoice, O righteous, and shout for joy, all you upright in heart.” This follows verses about living righteously, trusting in God, confessing our sin to God. While I don’t subscribe to the theology of “Trust in God, and everything will turn out well for you”, I do believe that when we are honest with ourselves, others, and God… (confession), when we praise God, when we trust in God despite what’s happening.. when we do these, God gives us the strength to be joyful, to trust, and to keep being faithful. It’s easier to think these things on a spring-like day, when lambs are jumping, when the weather’s warmer, when I’ve seen the emus, when we had fun swinging with Kajsa, when it was overall a good day. But even if it was a bad day, hopefully I could be glad in the Lord, and rejoice.